November 7, 2011 – I love seeing kids get better in their senior season. There’s the old saying “the light comes on” meaning everything seems to make sense for a young kid on the field for his position and team to react and make big plays. This is a great example of what has happened to a young man named Zach Hetrick from Central High School, who stands a legit 6-3 in height and weighs between 225 and 230 pounds. I noticed Zach three years ago when he was starting at Defensive End at Central High School, and he showed good strength and good speed for such a young player at that time. During his junior year, he beefed up and still had the size and height, but you could tell he was way under the radar. This year Zach moved to Linebacker midway through the season and has been on fire making big plays game after game. This is a kid who’s made what I call a smooth transition from one position to another during his senior season, and he looks like he’s been playing the position for many years. It looks like Linebacker is his more natural position for the next level. When I see this kid as a Linebacker, the most impressive thing he does is read and react in pass plays. Not many Linebackers in high school have the ability to cover Running Backs or Tight Ends in the open field. He’s shown he can do that from sideline to sideline because he reads plays before the snap and has had interceptions because of that in coverage. Zach has offers from three IAA colleges as a Defensive End, but in my opinion colleges need to take notice of his speed and now great size for a position called Linebacker. If he does sign with a IAA school, I think he will be moved to Defensive End and probably play at 235 or 240 pounds, and that’s great size and height (6-3) for a IAA program for that position. However, if he goes DI I see him as a Middle Linebacker with deceptive football speed and great instincts for the game. When colleges watch tape of kids they don’t say that they will move a kid to Linebacker in college and see what happens and give him a scholarship. Instead, they say that they wish they could see this kid at Linebacker and see if he can make the transition. Well Zach did just that in 2011 for the colleges to see. 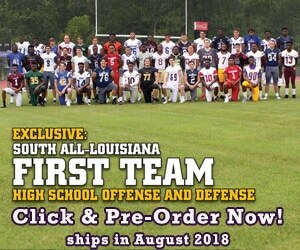 Be sure to order the 2011 preview of Louisiana Football Magazine at www.lafootballmagazine.com/store to read more on Zach Hetrick from Central High School. Limited copies are available so get yours now. Also Lee Brecheen will be having a Louisiana Football Magazine signing for all fans, coaches, players, friends and long time readers who have been reading since the Magazine came out in 1996. The event will be held at Barnes & Noble Bookstore in Citiplace in Baton Rouge on Thursday November 10th from 7:00 PM to 10:00 PM. I hope you enjoy the interview below by writer Mark Clements. ZH: I’m 6’3”, 230, and I run a 4.7 or 4.75. ZH: Definitely LSU and New Orleans for sure. That’s all I grew up with and learned to love. ZH: Not really, I just really like sports and football is one of my favorites. ZH: Yeah, I play golf. LAFM: Do you play any other positions besides defensive end? ZH: At the beginning of the season, I played straight D-end-, maybe a little tight end. But now, I’m starting at linebacker because one of our starting linebackers went down. But I still do play some tight end as well. LAFM: At the next level, do you see yourself playing defensive end or making the full switch to linebacker? ZH: I’d like to stay at D-end, but I could see myself as an outside linebacker, hybrid kind of guy. ZH: I like DeMarcus Ware. I like his tenacity and the way he approaches everything. He doesn’t give up. ZH: I think my speed and awareness of where the ball is going is definitely one of my strengths and I need to work on just my technique overall. I need to work on my technique overall. I get sloppy whenever I get tired. ZH: This summer mainly I went to Vanderbilt early in the summer, went to [Louisiana] Tech, McNeese and ULM. ZH: I have three offers so far – McNeese, Southeastern and South Alabama. ZH: I like McNeese and just the atmosphere. And I have some of my buddies playing up there graduating from high school. ZH: Pre-med or definitely something in the medical field. ZH: I definitely want to make a run at the playoffs and we’re working towards that. I just want to be one of the top players on the team making plays overall, whether that’s tackles or whatever it may be. ZH: I definitely love playing Zachary and Denham. Those are our biggest rivals and it’s always an electric atmosphere. ZH: This year at Denham, we had to go into overtime and beat them by a field goal. It was crazy and was definitely one of my favorites. ZH: I have a 3.8 GPA and a 23 on the ACT.